We've partnered with our friends at Teabookᵀᴹ to offer the Glasstic Teabook Pack. Includes 1 Teabookᵀᴹ design printed bottle in your choice of one of six cap & base colors, a Glasstic Tea Filter, a Glasstic Bottle Brush and 3 packs of loose-leaf tea compliments of Teabook. 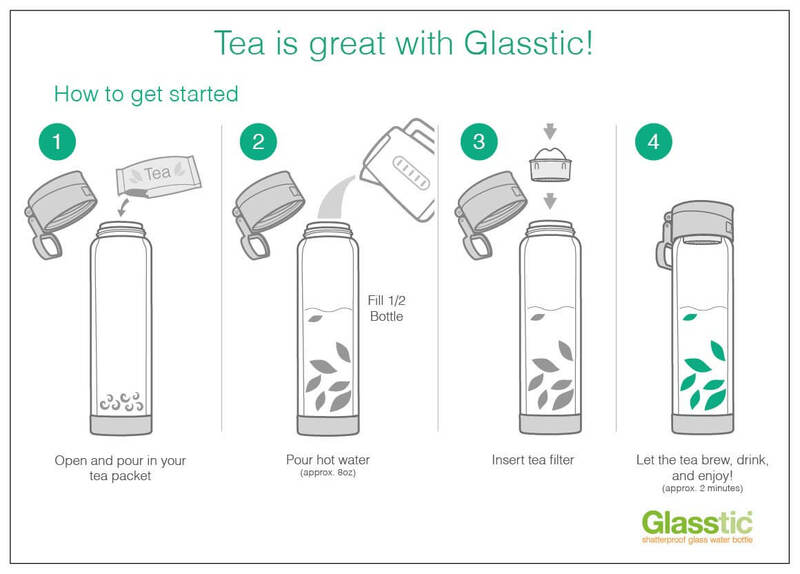 Enjoy delicious loose leaf tea in the Glasstic glass water bottle without getting any leaves in your mouth. Easy to use and allows you to brew your tea while on the go. The Glasstic Tea Filter fits securely in the mouth of the glass insert and has a handle for easy removal. For Loose Leaf tea: Remove the cap and pour in your tea packet. Fill the bottle half way with hot water (approx. 8oz). Insert the tea filter with the holes down and replace the cap. Let the tea brew (approx. 2 minutes) then drink and enjoy! Wide Mouth Glass Water Bottle – works great with loose-leaf teas and as a fruit infused water bottle as well. Make a tea with lemon in the morning and a cuccumber water in the afternoon...works well with both hot and cold beverages. Leak Proof Flip Cap Lid with Handle and Lock – make sure your tea stays in the bottle and doesn't make a mess! Slide on the 'safety' lock to make sure you have the lid closed so you know you won't have leaks. BPA-Free - Toxin Free - stop worrying about BPA or BPS and start making some yummy teas to help make the day that much better. With glass bottles you get to enjoy great tasting teas and other beverages without the worry about harmful toxins in plastic. Durable and Shatterproof - built tough, the glass bottle insert is approx. 4mm thick glass so you know it can take a beating. If the bottle were to break the simple innovative design helps protect against dangerous messes and you can easily add a replacement and be back in business! Easy to Customize – you can change up this or most other Glasstic bottles to make your very own personalized water bottles using our design tool or Style InsertsTM. This is in addition to making your own inserts or even using small window clings or vinyl stickers. All products purchased from www.glassticwaterbottle.com are automatically covered. If needed, you can request parts replacements here: http://www.glassticwaterbottle.com/lifetime-part-replacement/.